Customer interviews can be scary. They mean putting ideas on the line before they’ve been perfected, and potentially having them shot down in a matter of seconds. What’s important to keep in mind, however, is that this process is inevitable. You don’t get to choose whether or not it takes place—you only get to choose when, and under what circumstances. Once you’ve developed an idea and release it into the wild, you’re essentially submitting yourself to mass, uncontrolled customer feedback. And if you haven’t done any research up to this point, you could be in for a nasty surprise. When the choice is between early-stage, controlled, informative feedback, and too-late, uncontrolled, volatile feedback, suddenly your decision is a lot easier to make. A customer interview is one of the best tools we have for research. We can use it to dive deeper into questions gleaned from surveys and online communication, and get some qualitative validation on important questions around our ideas. A customer interview is ideally performed by two UX consultants: one to take notes while the other conducts the interview, undistracted. It not only covers the customer in relation to their job, but as a whole person—their interests, skills, background, goals, and troubles. How customers interact with your product or service is dramatically affected by their environment and personality. Focus groups are often the default method when companies want to employ research, but they bring up tricky group dynamics that can be difficult to navigate even for an experienced interviewer. One-on-one customer interviews let you give your undivided attention to a single person at a time, which means that you can pick up on things like body language and subtle tones of voice that might prompt you to dive deeper. The overwhelming nature of focus groups, on the other hand, makes it much harder to notice all of these aspects. Bonus: Decided to start interviewing some customers? Your next customer interviews will go smoothly if you follow our free best practices guide. Your next customer interviews will go smoothly if you follow our free best practices guide. Subscribe to receive this extra resource. To make sure your interviews get useful data, you need to structure your interviews carefully. Rather than using multiple choice or yes/no questions, opt for open-ended questions that enable the customer to explain their answers. Not only will this get you more useful information, but it also makes things more comfortable. Instead of the interview feeling like a spoken questionnaire or interrogation, it feels more like a real conversation — which helps the interviewee feel more relaxed. Avoid getting too granular with your questions. People generally don’t remember every precise detail of an experience, but instead register specifically positive or negative highlights. As an example, instead of asking “What did you think about the color of the buttons?”, ask “What aspects of the design stood out to you?” You’ll get more open, honest, and thoughtful answers, rather than an isolated reaction. Also, remember to keep your questions neutral. It can be tempting to use leading questions, as the answers will skew toward validating your idea. But validation isn’t the only goal of research. You want to earn your way to a true understanding of your customers — rather than cheat your way to a “validated” assumption. A customer interview is not a pitch. The interview isn’t about you, your product, or your ideas. It’s about your customers’ problems. This approach removes the stress of wondering what customers will think about an idea, and instead puts the focus on solving a real pain point. Customer interviews are great at telling you what customers think of your product or service as a whole. They can inform you of gaps in your user experience, and how each part of your offering is (or should be) connected. How does your SEO impact the experience of your website? How do your emails impact your customer support? Now we have something to work with. We can see how the different facets of the service work together to create this hard-to-define user experience. The physical location and branding of the post office, the website, the item’s size, the phone’s signal connection within the post office, and the optional extras all play a part in the experience. This is what customer interviews can reveal. Based on this example, a quick solution would be to offer free WiFi in the post office, which would make the whole experience run smoother. 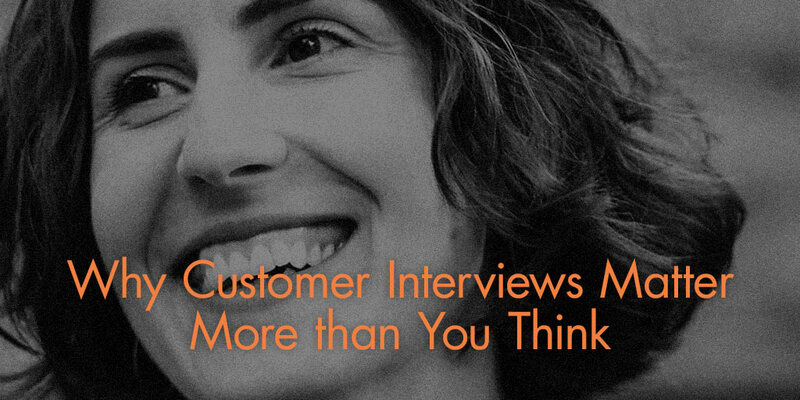 Customer interviews reveal how the different facets of your user experience work together. “The critical incident method is especially useful for such exploratory interviews: Ask users to recall specific instances in which they faced a particularly difficult case or when something worked particularly well. These extreme cases are often more vivid in users’ minds, and will give you the details needed to come up with useful features,” says Jakob Nielsen. When you’re ready to start customer interviews, the first step is recruiting your participants. You want to make sure you’re talking to the right people, so be selective and try to get a representative sample of your entire customer base. Choosing the right participants is always a critical first consideration, and we recommend starting with a minimum of six interviews. Having too small of a sample won’t produce any meaningful trends or patterns – and that’s exactly what you’re looking for!